DII offers napkins in countless colors, assuring you’ll find the perfect color for your table. All napkin colors coordinate with the DII placemats, table runners and assorted tablecloths. This makes it simple to create a perfectly coordinated table setting. DII’s napkins will add depth & richness to your table setting. 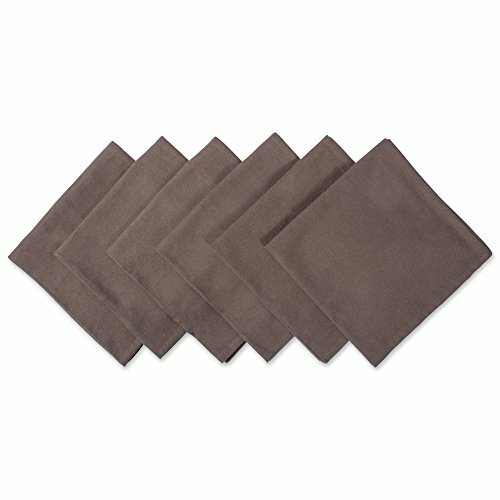 For formal or everyday meals these napkins will easily cover laps, wipe hands clean, and look sharp while doing their job. DII’s napkins are a staple for every kitchen table, breakfast nook, and dinner table. These versatile napkins make great housewarming or mother's day gifts as well. To ensure these napkins last time and again follow care instructions: Machine wash cold with like colors. Tumble Dry Low. Low Iron. To minimize shrinkage after washing, do not dry the napkins on high heat and do not dry fully. Medium heat is best and remove just prior to being completely dry. To view our entire selection of kitchen & tabletop linens search: DII Tabletop or visit our store front by clicking the DII link at the top of the page to view our other collections. CREATE A FUN & RELAXED PLACE SETTING - Oversized everyday cotton napkins measure 20x20" for formal or casual meals. MAINTAINING COTTON NAPKINS - To maintain the quality nessesary, nothing has been added to the cotton. Because of this, the all-natural fibers will shrink upon the first washing. To minimize shrinkage after washing, do not dry the napkins on high heat and do not dry fully. Medium heat is best and remove just prior to being completely dry. ENHANCE YOUR HOME - Dress these napkins up with napkin rings or for a casual meal keep it simple and folded in half by the plates, use throughout the year or spread the joy and give as a housewarming gift. NAPKINS WITH POTENTIAL - Not only do these work for the home dining table but these could also be used for, banquets, buffets, wedding receptions, holiday parties, or any other event. FOR MORE DII PRODUCTS - DII offers delightful home & kitchen products including charming napkin rings, placemats, and tablecloths. To view more collections click the DII link at the top of the page to visit our Store Front.